With Rupert Neve’s pedigree in transformer-based equipment design, a DI box was surely just a matter of time. It’s a sobering thought for me that, when I first walked into a recording studio in 1972, the active, phantom-powered, transformer DI simply didn’t exist. It wasn’t until April 1975 that the now defunct US-based DB Magazine published the details of an active, phantom-powered, two-transistor, transformer DI — developed for Leon Russell’s studio — that remains, to this day, the basic template for an active, phantom-powered, transformer DI. Transformers continue to be held in high regard by engineers, none more so than those designed by Rupert Neve, but we’ve all had to wait a long time for an active transformer DI bearing his name to appear. 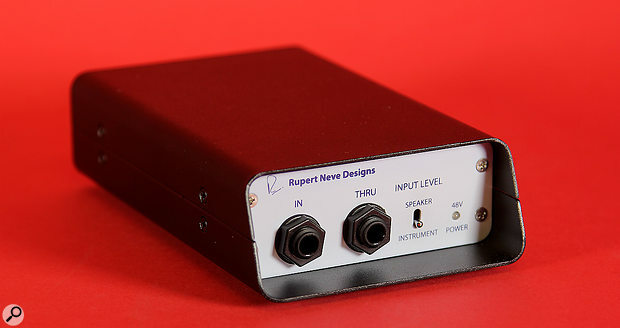 Developed by the engineers at Rupert Neve Designs around a new transformer design from the master, the RNDI Active Transformer Direct Interface builds on the legacy of that 1975 design to create a DI capable of handling any input signal, from the sub-100mV output of an electric guitar pickup to the 92V RMS of an amplifier driving 1kW into 8Ω. With its black clamshell case and recessed light grey end panels, the RNDI exudes class. There’s not much to look at — one end carries the in and thru quarter-inch jacks, the Speaker/Instrument selector switch and 48V power indicator LED, whilst on the other end you’ll find only a balanced output XLR and ground-lift switch. Electronically, the 48V phantom-powered circuitry is fully discrete, with not an op amp to be seen. At the Instrument setting, the RNDI’s Class-A-biased FET buffer amp has a 2.2MΩ input impedance that correctly loads electric guitar pickups. Since this setting can actually handle input levels up to +21dBu without distortion, you can connect almost any guitar preamp, keyboard, drum machine or line-level source to the RNDI without a pad. With the switch in the Speaker position, the input impedance drops to 200kΩ and the input level before distortion jumps to +41.5dBu. Following the buffer stage you’ll find the RNDI’s custom, phase-coherent transformer. As well as having the potential to contribute the second- and third-order harmonic distortion and the sense of ‘analogue warmth’ that a transformer can deliver, this Rupert Neve-designed component also possesses an output impedance of less than 40Ω, which enables the RNDI to drive long cable runs with minimal loss of high-frequencies. The maximum output level is either +21dBu in Instrument mode, or +41.5dBu in Speaker mode.Unfortunately, for me at least, there is no option to use an external power supply with the RNDI — I have a few old, good-sounding analogue bits and pieces that lack phantom power. In my situation, an external PSU option would be really useful. I ran a variety of electric guitars, electric basses and piezo-equipped acoustics, both with and without preamplifiers, through the RNDI, which delivered the direct-injected sounds of the individual instruments with clarity and depth — exactly what I’d expect from a high-quality DI box with a real-world frequency response of 12.5Hz to 63kHz. To my ears, there’s a subtle, but definite, character to the sound of the RNDI that appears to be more pronounced at higher input signal levels, presumably due to increased levels of harmonic distortion being generated by the combination of FET buffer amp and transformer. It is an attractive sound that I felt had more going for it than that of a transformerless active DI, which seemed slightly more clinical in comparison. Taking a feed from the extension speaker socket of a valve guitar amp worked perfectly, although it was impossible for me to judge where the distortion from the amp ended and that of the RNDI began. The RNDI is certainly a class act. Its high-quality construction and superb sonic performance put it up there with the best phantom-powered active transformer (and transformerless) DI boxes around. 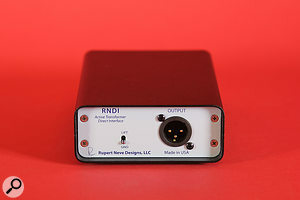 Although I think that its appearance may well confine it to studio use, the RNDI is rugged enough to stand up to the rigours of the road, where its ability to deal with high-wattage outputs and to drive long cables would make it ideal for delivering clean feeds from instruments and from the outputs of stage amps down a couple of hundred feet of multicore. If you are in the market for a really high-quality active DI box, the RNDI has to be on your audition list. However, please don’t think that you’ll be getting the sound of a vintage Neve console as part of the package — you won’t! What you will be getting is a superb DI box that can add its character to the colours of your sonic palette. The RNDI isn’t cheap, but quality never is. Highly recommended. At this performance level, your alternatives could include the Countryman Type 85 or, if you’ve a bit more budget available, a combination such as Radial’s J48 and JDX 48. If you’re into DIY, the Bumblebee Bb-D1 Spark could come into play. Finally, depending on your application, a preamp/DI combination could also be an option. Can handle the output of virtually anything you throw at it. Has an attractive sonic character. Not the cheapest DI you’ll find, but worthy of its price tag. 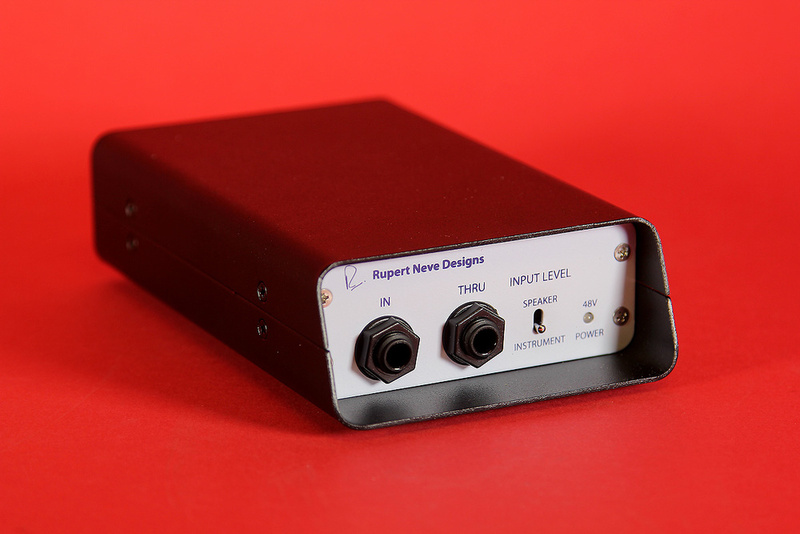 The RNDI is a high-quality, high-performance active DI, built around a new Rupert Neve-designed audio transformer, that is capable of handling everything from an electric guitar pickup to a 1kW amplifier running at full power. It looks classy, sounds superb and performs to a very high standard. Highly recommended.